INCH by INCH – The Body Temple is where we help you to reconnect with your body. We assist you to decode your body and also provide you with comprehensive solutions to take care of this god's greatest gift. Everybody is unique and different hence we have a team of certified trainers and nutritional counselors who after studying your body come up with comprehensive and unique solutions to suit your body requirements. We provide you with the finest equipment and fitness knowledge to help you achieve your fitness goals. A globally proven fitness training module is followed by us that is further upgraded from time to time through different training programs. 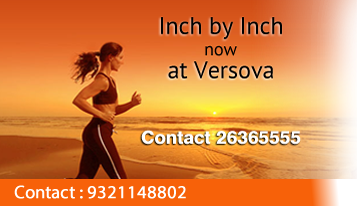 Introduced in the year 2002 at Marine Lines, INCH by INCH is also located at Tardeo and Matunga. And we will be soon launching our new center at Versova. INCH by INCH:- The body temple is promoted by Shital Nahar. She has been in to the fitness industry for over 11 years. After travelling around the world and exploring new international fitness programmes she now aims to bring the international fitness programs even in India through INCH by INCH. Thus, providing the fitness lovers hear a world-class fitness regime. Future Plans :- We intend to take fitness and wellness to the next level. Apart from expanding our branches through self-owned as well as franchisee model across Mumbai and suburbs, we also plan to take up consultancy programmes with different corporates, setup wellness centers in companies that would help to motivate the employees and help them to perform better. Today where stress and work pressure are taking a toll on the physical as well as mental fitness, we would provide practical solutions for managing stress and would help them to live better.